When I got into scripting, I wanted to solve the many redundant and tedious tasks of motion graphics design I encountered, primarily the easing, offsetting, and positioning of layers. These are very important tasks that any motion designer would have to do, and I have relieved many of these issues with Dojo Ease and Dojo Shifter for easing and offsetting. My newest script, Dojo Orbit, provides a nice solution for positioning layers in circular and spiral formations, something very difficult to do manually without tons of expressions. There are many scripts on aescripts that can do what Dojo Orbit does, but with more options and controls. 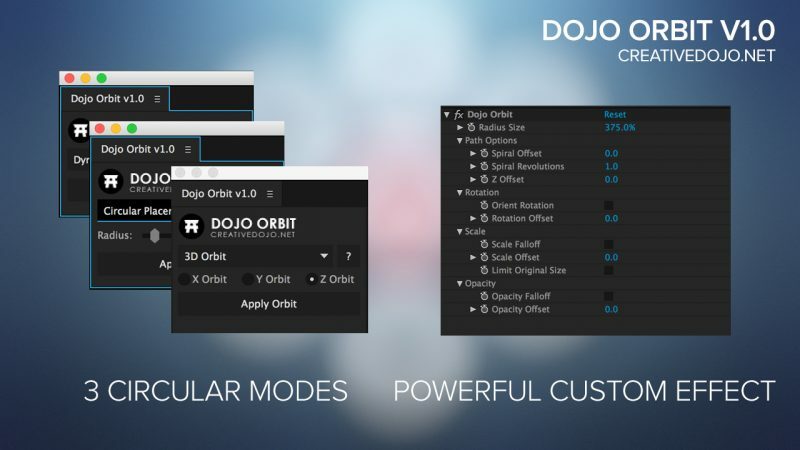 Dojo Orbit is a catered solution to my needs which I had developed earlier, but decided to release it to the public now after a revamp. You can download Dojo Orbit here at the store. The script is under the “Name Your Own Price” platform, so pay whatever you wish if you find the script useful. I want to thank Mocarg and felt_tips from the VideoHive’s forums, Xinlai Ni from CreativeCow, and JJ Gifford for help and tips on expressions for tackling some of the positional functions. Hope you guys enjoy the script and find it useful! If you have any questions or suggestions for improvement, feel free to drop a comment below.